Everyone knew Phil Bishop. He was that sort of man. Anywhere speedway has been staged the name of Phil Bishop was famous. Typical of the universal popularity was the inclusion of an action picture of Phil in this year's World Final programme from Poland. But looking back on a career of 42 years in speedway it was little wonder that he became so famous - more famous than men who have become World Champions! Phil rode nearly everywhere where speedway was staged and was disappointed by the fact that he had never had the chance to appear in Japan or the Soviet Union. His speedway racing life started at High Beech in 1928 when he took part in the meeting that is popularly favoured as Britain's first look at dirt track racing. Phil would recall that he fell off! In the ensuing years Phil became acquainted with as many hospitals as he had countries. He broke every bone in his body at some stage in his racing career. When the time came for him to retire from riding Phil, a wheelright by trade, became a keen administrator. He linked with West Ham as team manager where his experience and fatherly guidance were invaluable to the young men at his command. He retained a link with Holland where his track deeds had made him a hero. It was from one of his trips to Holland - the last for speedway, he had said - that this most horrible tragedy occurred. Phil Bishop, pioneer, ambassador, sportsman and gentleman, will be remembered wherever the sound of a speedway engine can be heard. Instant successes are rare in speedway. But in its own way, Peter Bradshaw's first appearance was one of those occasions. It was for King's Lynn second team in 1969 and Peter did well enough to show Lynn that he was Division One material. After that he stayed in the top flight and earned his international colours. At the beginning of the 1970 season the good looking man from Melbourne switched to West Ham. It was a move that delighted him. With his wife and son he settled down in Britain, living near Harlow. His stay at West Ham was all to brief. During that time he broke a collar bone and it was not too long after that the tragedy of Lokeren befell him. It takes courage to come half way round the world to try your luck in speedway. But Malcolm Carmichael, another young man from Melbourne, did that without very little warning. He had palled up with Roy Trigg in Australia and in fact was living with Triggy in South London at the time of the Lokeren tragedy. It was Trigg who suggested that Mal should try his luck in Britain. A number of the tracks gave the young Aussie a chance in their second-halves, including West Ham. It seemed that a team place in either Division One or Two wouldn't be too long in coming. Phil Bishop invited Mal on the trip to Holland and he accepted any chance of a ride, any chance to broaden his riding experience. It is ironic that Carmichael's story should run on similar lines to that of Dave Willis, a young Australian who tried his luck with West Ham six years earlier, only to die to a track crash at Custom House. Carmichael was keen to succeed. He was never given the chance. Popular wherever he travelled. That was Gary Everett, the Wimbledon rider who made a fateful guest appearance in West Ham's colours on the trip to Lokeren. Everyone liked Gary and his loss came at a time when he was establishing himself as a vital part of Wimbledon's League and Cup double bid. His first association with motorcycles was on the scrambles circuits but he moved onto speedway where he first made a name for himself at Hackney. Gary went so far at Hackney before deciding that it might be better for his future if he had a change of track. It was then that Gary, married for only a year before his death, made the move across London to Wimbledon. He quickly fitted into the way of life at Plough Lane and his friendly personality endeared him to the Dons fans. Surprisingly Gary had been riding league speedway for no more than two and a half seasons. Who will ever know whether he would have become a leading figure in the sport he loved? England had already honoured Martyn Piddock at full international level. That after just two years of racing experience. Piddock was one of the new brigade. A product of Division Two and a young man set for great things in a speedway life. 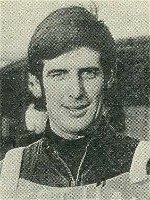 In Kent he was a grass tracker of no mean ability and when Canterbury opened at the beginning of 1968 Martyn was immediately put in their team. All the time he was being kept on West Ham's short list for future stardom and after two years of Division Two grooming he moved into Custom House. The miserable luck that haunted West Ham even before Lokeren threw an extra burden on this young man and it said much for his ability that he became a valuable point scoring member of the Hammers septet. The way was clear for Martyn to reach the speedway heights. Alas, we shall never know whether he was one young Englishman who could have challenged the world. "I have this programme and was at the mmorial match, really moving although I was only a teenager."